As New Year’s Eve approaches, we are greeted with the familiar sights of fireworks, the sounds of annoying Vuvuzela-like party favors, and the coming of cheesy year-end recap. posts! 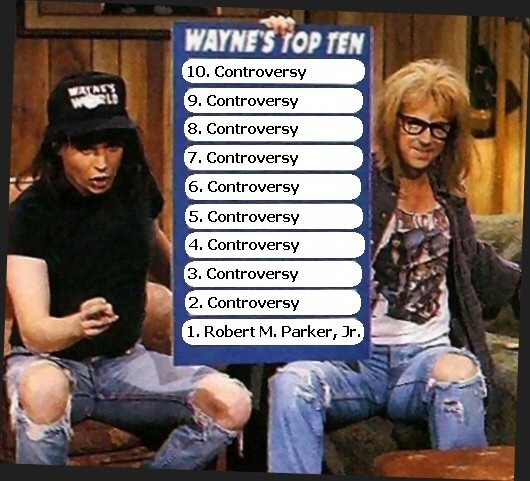 So today, we’re not ranking wines, but articles. I had fun pulling together the 2009 recap. of the most-commented posts on 1WineDude.com, so I thought I’d do the same for 2010, using the totally unscientific method of listing all of the posts form the Archives page and ordering what looked like the ones with the most comments. The rationale of course being that these are the posts that you, the extraordinarily talented, modest, and altogether too-good-looking 1WD readers felt were most worth the effort of contributing your time, passion and opinions. And in February, the crime scene to which I’ll be returning is the lovely Meadowood in Napa Valley, where I’ll be a panelist at the 2011 Symposium for Professional Wine Writers. Some of you out there in blog-o-land might recall that I was lucky enough to receive a fellowship to the same event in 2010 and even luckier to take part as a panelist during the time I was there. I remain, as ever, totally amazed at the gullibility generosity of those within the world of wine that they continue to ask me to take part in such wonderful events as the Symposium, and it’s my intention here to convince any of you who are budding wine writers to go to this shin-dig. 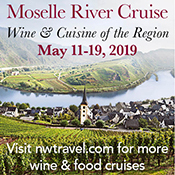 Yes, it will cost you a few hundred bucks, but there exists no better event on offer with such concentrated wine and writing talent (excluding your truly, of course!) in the United States. It’s like wine writing crack, only more intense and very likely healthier for you, assuming you’re not actually taking crack while attending the Symposium. And while it may not actually be easy, all things considered it’s a hell of a lot easier than trying to garner such collective wine-writing wisdom and experience by your lonesome self! The WWS is also the place where you’ll get a chance to rub elbows with the likes of Antonia Allegra, Gerald Asher, Lettie Teague, Jack Hart and Dominique Browning – there’s some serious writing clout in the speakers list for this thing. I’m honored and excited to be sharing the panelists’ table with Lettie and Doug Cook, but for the most part I’m gonna be in the bleacher seats soaking in all of the good stuff, just like everybody else. And taking a copious amount of notes. So… if you’re based in the U.S. and are at all interested in seriously applying the craft of writing to the world of wine, then I sincerely hope to meet you there! 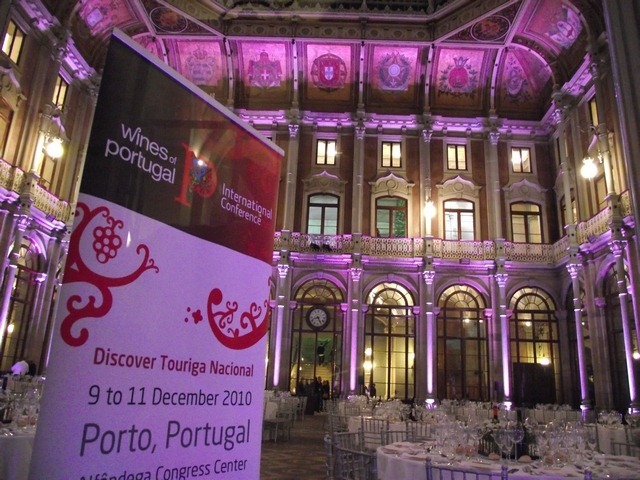 The Great Red Hope: Portugal Bets On Touriga Nacional, But Is It A Winning Hand? The first thing that you need to know about the recently-awarded Top 10 Touriga Nacional wines from Portugal is that there area actually 12 of them. Such is the strangeness of Portuguese wine politics that a contest selecting the top ten single-varietal bottlings of Touriga Nacional – the grape on which Portugal’s red table wine future seems to be staked (according to the focus attended to it at the 2010 Wines of Portugal International Conference in Porto) couldn’t actually stick to the rules of its namesake. The Top 10 TNs were winnowed down from a list of thirty TN bottlings selected by ViniPortugal (the group who organized the conference and who are charged with promoting Portuguese wines internationally, who got the list down from 80 submitted samples) through a panel of tasters that included MWs Jancis Robinson, Doug Frost and Mary Ewing-Mulligan (among others). 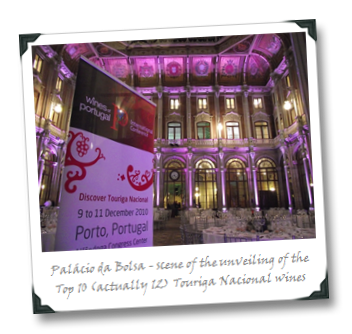 The 12 winners of the 10 were then presented at a gala dinner event at the stunning Palácio da Bolsa in Porto, following Day One of the conference.